Jodie Ginsberg: "Free expression needs defenders"
You can donate to Index on Censorship here. This is the text of a speech give by Index on Censorship CEO Jodie Ginsberg at the Freedom of Expression Awards on April 13, 2016. In the very first edition of Index on Censorship magazine – published in 1972 – the then editor Michael Scammell wrote that a definite need existed for such an organisation… only time will tell whether the need is temporary or permanent. Sadly, 43 years later – as evidenced by tonight’s winners – the need seems permanent. Our aim though, remains to be temporary – our goal is nothing less than an end to all censorship. That’s some target, but if those whom we have honoured here this evening have shown us anything, I hope it’s that is this a target worth aiming for. 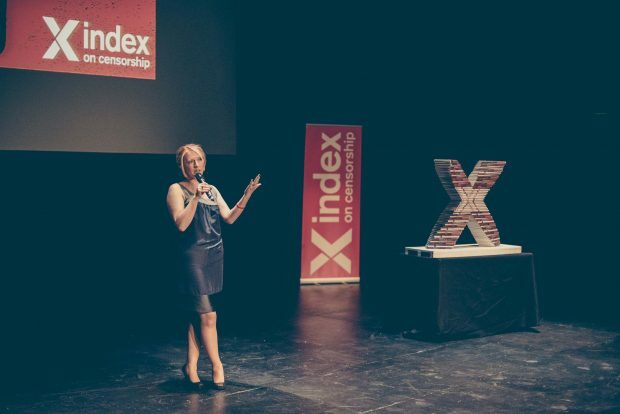 Index challenges censorship and celebrates the value of free expression in four ways. The first is through the publication of works by censored writers and artists and about censorship. We do this through our magazine, a copy of which you all receive this evening, and through our website and social media. If you want a reminder of how censorship remains as live an issue as it was in 1972, in this issue you will find a story from Azeri playwright and poet Akram Aylisi, whose books were burned and his title of “People’s Writer” revoked after he dared to discuss the Armenian genocide. Just this month he was barred from leaving the country. We challenge censorship through campaigning. This year we will be campaigning along with other like-minded organisations to ensure the government’s planned new extremism bill contains none of its proposed new curbs on free speech. We challenge by encouraging debate such as one held here at Unicorn Theatre last year following the cancellation of Homegrown — whose director Nadia was one of tonight’s guest presenters, by the National Youth Theatre. And we challenge censorship by supporting those on the frontlines of its defence. Each of tonight’s winners becomes an Index fellow and we will work with them for the next year to help make sure we can magnify their impact at home and abroad. We have heard stories tonight of what censorship means in practice. Tonight I want to share with you another slice of Index history: a video made for Index 30 years ago that I think drives home all of those stories. Free expression needs defenders. It needs defenders to ensure that Zunar does not go to prison for 43 years – another Index lifetime – for drawing cartoons of Malaysia’s Prime Minister. It needs defenders to help ensure that the world in which Zaina’s six-week-old baby, who joined her in London this week, grows up to be a woman who can speak freely, and – if she so chooses – report freely. It needs defenders so that Nabeel Rajab, one of this year’s awards judges, is free to travel and speak freely without fear of jail, harassment or torture. So what I want you to do this evening is very simple. I want you to reach into your programme and take out the pledge card you’ll find there. Then I want you to take a moment to think what you might otherwise have spent this evening. Then I want you to take a pen and write down that figure – or a higher one – to help ensure that Index can continue to defend free speech. If you can’t do analogue, you can text FEXY16 £10 to give us £10 right now. We might not end censorship immediately but with your help we can make ourselves a little less permanent. Thank you. To end this evening I am delighted to introduce Martyn Ware, who will present our inaugural Music In Exile Fellowship. The MIEF is a joint initiative with the producers of the film Music in Exile, which explores the plight of Mali’s musicians after jihadists banned music in the country. Moved by their experiences, producers Johanna Schwartz and Sarah Mosses approached Index to see what we could do to support persecuted artists like those featured in the film. Indeed, one group featured, Songhoy Blues, was shortlisted for an Arts award last year. The MIEF, funded through money from special screenings of the film and other events, will support one musician each year as part of the Index awards fellowship. I’m delighted that MW of Human League and Heaven 17 fame is here to present it.